I saw a news report that seemed to indicate that schools can no longer hold bake sales or sell chocolate bars as fundraisers. Can that be right? The new nutrition standards have indeed gone a step further this school year as rules for snacks and other foods sold during the school day have taken effect. 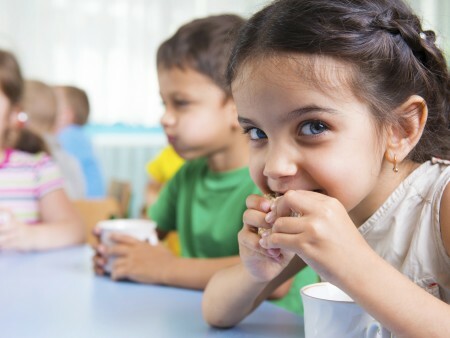 With healthier school breakfasts and lunches already being offered, the new standards for snacks and fundraisers are meant to send a clear message about healthy eating and provide a way for students to actually form healthful eating habits not only at meals, but throughout the school day as well. The school snack standards say foods and drinks sold during school hours, including items in vending machines, school stores, and a la carte cafeteria menus, cannot exceed limits on fat, salt and calories. Whole grains, fruits and vegetables, and other nutrient-dense foods are encouraged. Foods sold in school fundraisers must meet the same guidelines. The standards are for foods sold in schools. So, bake sales held during the school day would be covered, but snacks brought to the classroom by a student or parent would still be permitted under the federal rules. However, before sending Junior to school with a container of cookies for his classmates, you should check with your teacher or school to see if there are any local guidelines in place. While some people are criticizing the new standards as overreach, the reasons behind them are crystal clear: The latest figures, from 2012, show that more than a third of children and adolescents are overweight or obese, leading to concerns about long- and short-term health issues. Obviously, not everything a student eats or drinks is purchased at school. Still, public health authorities believe schools can play a particularly critical role in supporting the development of healthy behaviors from an early age. In a study published in 2009 in the Journal of the American Dietetic Association, researchers found that 40 percent of students in 2005-06 consumed at least one food or beverage as a snack during the school day, and most of the time those snacks were very low in nutrients and high in calories. In other words, junk food. By the time students were in high school, 55 percent snacked during the school day, averaging an extra 220 calories a day. Now, when students grab a snack at school, it will more likely be a 90-calorie granola bar rather than a 240-calorie doughnut, or a 160-calorie snack bag of light popcorn rather than a 190-calorie pack of chocolate cookies. In addition, fundraisers are starting to move away from chocolate bars and other high-calorie foods and more toward other items, such as those emphasizing school spirit and other gifts. To learn more about the new standards for healthy school snacks, see the U.S. Department of Agriculture’s web page at healthymeals.nal.usda.gov/smartsnacks. Action for Healthy Kids has some great healthy fundraiser ideas at bit.ly/actionfundraise. Chow Line is a service of Ohio State University’s College of Food, Agricultural, and Environmental Sciences and its outreach and research arms, Ohio State University Extension and the Ohio Agricultural Research and Development Center. Send questions to Chow Line, c/o Martha Filipic, 2021 Coffey Road, Columbus, OH 43210-1043, or filipic.3@osu.edu. Editor: This column was reviewed by Carol Smathers, field specialist in Youth, Nutrition and Wellness for Ohio State University Extension, the outreach arm of Ohio State University’s College of Food, Agricultural, and Environmental Sciences.